The Election Commission of Bhutan (ECB) is a regulatory authority - a facilitator charged with the responsibility to promote a healthy democratic culture, ensure fair play and safeguard ideals that would encourage enthusiastic participation in the democratic evolution, by the people of Bhutan for whom democracy is still a new concept. But I fear that the ECB - the torchbearer of the democratic process - has not been entirely democratic. On the contrary, I believe that they have violated the most fundamental of rights guaranteed by Article 7:2 of the Constitution of Bhutan. The Common Forum dissertation is a great idea. Unfortunately, denying the candidates the freedom and the right to express themselves in a language of their choice has defeated the whole purpose behind the Common Forums. There is nothing democratic about the ECB requiring the candidates to express themselves in a language that they cannot speak. In fact I think this is infringement on the most basic of a human’s right. The Kuensel’s article reproduced below clearly indicates that Common Forums are relevant. 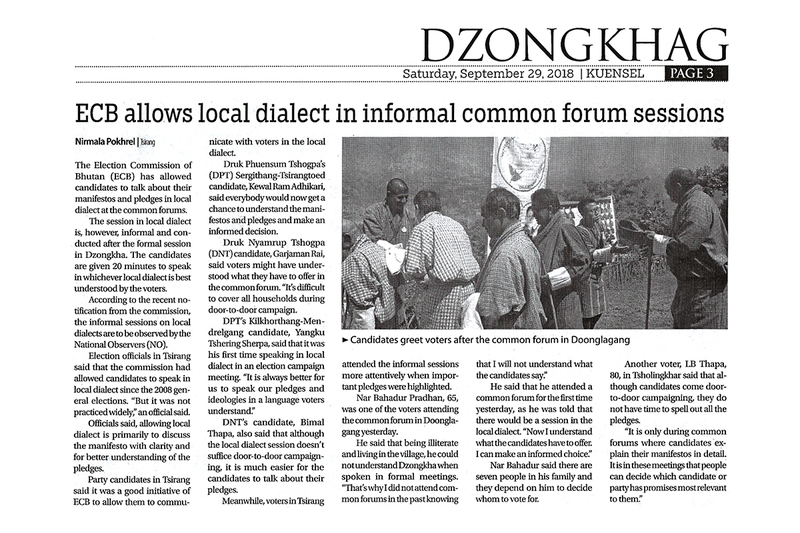 In fact one of the voters interviewed by the Kuensel’s reporter says that he did not attend the Common Forums of the past two elections because he did not understand what was being said. Another voter states that Common Forums in a language that they understand makes all the deference in making an informed choice. One friend and reader of my Blog (https://yesheydorji.blogspot.com/2018/08/hung-yegcha-gesa-jawai-lablo-shi-kae.html) called me to say that she did not agree with me that the language of the Common Forms should be in any other language, other than Dzongkha. I asked her why – her answer was: Dzongkha is our national language. So I asked her: by that you mean Tsangla, Khengkha, Bumtap, Lhotsamkha, Brokkat ---- are not our national languages? I explained to her that any language identified with a bona fide Bhutanese citizen, and spoken within the boundaries of the territory of Bhutan – must and should qualify as a national language. What is the logic in requiring candidates to speak in a language that they cannot speak? How is it meaningful to require voters to listen to a language that they cannot understand? Other than to inhibit the democratic process, what meaningful purpose does it serve?